You will fly above the most remarkable landscapes of the region... A rich and manifold natural environment where classified sites, castles and some of the most beautiful villages of France follow one another along the river Dordogne. Flights are scheduled at sunrise or shortly before sunset, when the winds are calm and the conditions are the best for ballooning. In the winter, it is possible to fly during the day because the sun is low in the sky and consequently the surface of the Earth does not receive enough heat to create wind turbulence. To each one their own first flight! An exceptional time for everyone! Toast with the balloonists or breakfast after landing. Travel in your own basket, reserved for you and your loved ones only! 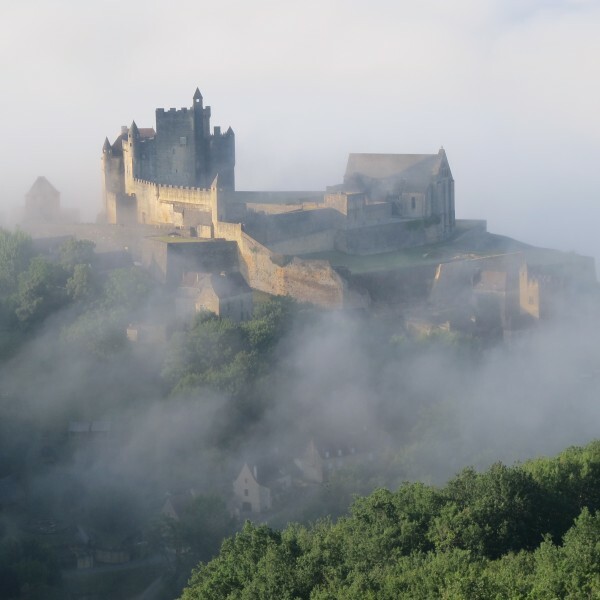 A flight above some of the gems of the Black Périgord region, followed by a tasting of regional produce served with a glass of champagne or local wine. Number of participants: 2 minimum / 6 maximum. Enjoy perfect photograph stability, optimum sharpness and a 360° panorama. You will first determine with the pilot what are the conditions required for your shooting (location over which you wish to fly, type of light, altitude, etc. ), and he will get back to you as soon as these conditions are met. Flight organized for one photographer and his or her assistant. Flight duration: between 30 minutes and 1h30.